Slowly slowly the sun is getting a bit warmer, hints of green are starting to grace the trees and the last stubborn piles of snow hidden away in sunless corners are diminishing by the day. To be fair, winter in Bulgaria, although at times it has been mightily cold (often below -20), the sunshine never went missing for too long. There were lots of beautiful days throughout the winter, cold, crisp and sunny. There were also a fair few grey, dreary, slushy days too, and periods when sections of pavements would be glazed with sheets of slippery ice. I am quite proud of myself for only slipping on the ice once this winter, especially with my dodgy knee. Having said that I do navigate the icy pavements like a 95 year old Grandpa. A couple of real life Grandpas and Babas even overtake me now and again too. It does get a little embarrassing I must admit. I suppose they're just used to walking in snowy and icy conditions where as back home if two centimetres of snow falls a national emergency is declared, all schools close and my mother goes shopping for 3 months of food supplies just in case. 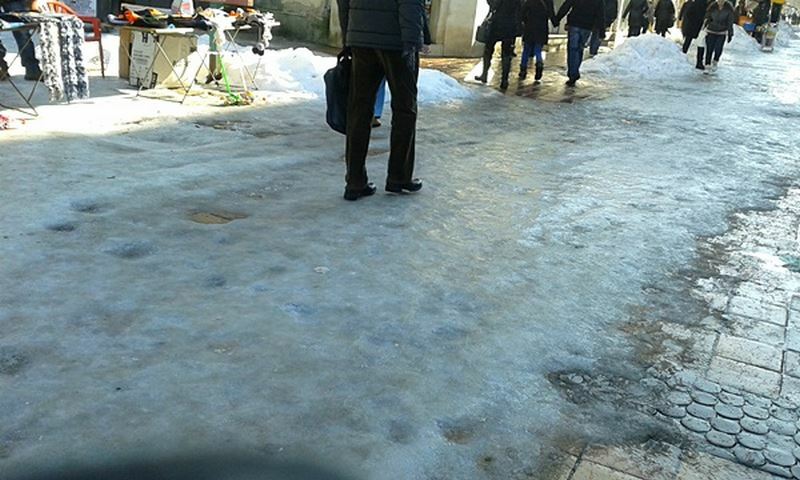 In Bulgaria I don't think people realise it's started snowing like in the apocalypse. Buses travel as normal, cars wizz by and overtake as normal (meaning they usually wait for a blind corner before overtaking) and nothing really seems to be adversely affected by the snow. Now rain and wind is a different matter. Bulgarians tend to be more wary of the rain and wind than they are snow. They don't let their children play in the rain where as in Wales if we weren't allowed to play in the rain we'd never have played outside ever, it was ALWAYS raining in Wales. I've also walked through a kids play park in Sofia on a beautiful sunny, windy day and was suprised not to see any kids playing as this park was usually packed with them on a Saturday morning like this. But this particular Saturday morning it was deserted. I couldn't understand why because it was so nice and sunny. At first I feared there was some kind of national mourning going on that I hadn't heard about and maybe it was rude to play in the park? Maybe I shouldn't be walking through the park? So I eventually spotted one father walking along with his son (wrapped up from head to toe with only his nose pointing out) and asked him where all the children were. "Ами духа вятър" came the reply. That was the first time I had heard 'the wind's blowing' being a reason to prevent children playing outside. A couple of weeks ago was 1st March or 'Баба Марта'. One thing I had learnt over my first 5 months in Bulgaria is that Bulgarians really like their celebrations (or 'празници'). At times it seems as if they've got some sort of 'празник' every other day. In January it just got ridiculous with about 5 or 6 name days one after another when I was still recovering from the new year celebrations (another 6 hour marathon on 'the table' drinking rakia, Don Bellisimo and red wine mixed with 'lemonade for wine' (лимонада за вино). 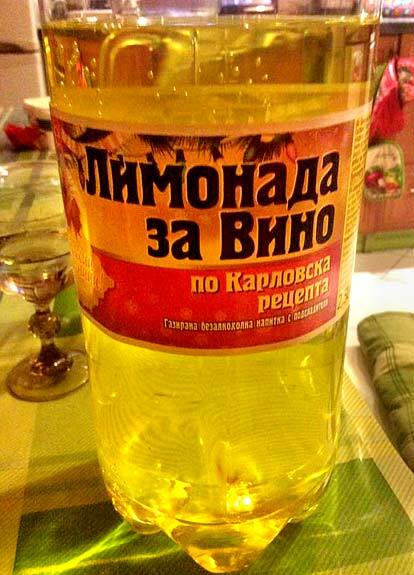 They sell this special lemonade for wine in the shops and I don't know what's special about it but I have only ever seen it in Bulgaria). Maybe a good reflection of how much importance is given in Bulgaria to 'празници' is the fact that the names of all 'празници' have to begin with а capital letter whereas not even the days of the week are considered important enough to have to begin with a capital letter. 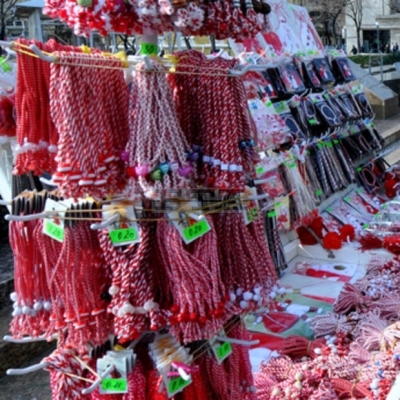 Back home we don't have 'name days' but in Bulgaria they certainly do and they also like to celebrate them. So for example if your name is 'Plamen' you can throw a party on 2nd January to clebrate that your name is Plamen. Actually 'Plamen' can also choose to throw a party on 6th February, 8th November and 20th December. These are the official days that 'Plamen' is allowed to throw a party. And invariably he does. I even know some people who for an excuse to have a celebration will also claim to be allowed to throw a party on someone else's day just because their name begins with the same letter. And never fear because even if you have a name that hasn't got an official 'name day' there is in fact an official day (9th March) when everyone that hasn't got a name day is allowed to throw a party and buy your friends drinks and snacks. No one in Bulgaria is left out of name day celebrations and no one gets away without giving a 'почерпка' (treating drinks and/or food). For different name days you have to follow different customs. 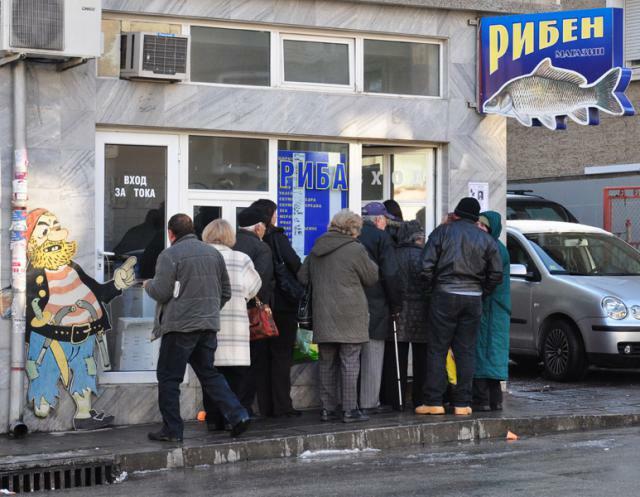 On 'Никулден' (Nicolas day) it is customary to eat fish and it is common to see big queues outside fish shops, and on 'Андреевден' (Andrew day) you can eat sweetcorn, although I haven't witnessed many Bulgarians paying much attention to this particular custom. No name days unfortunately are linked to pizza or ice-cream. One important thing to note about these Bulgarian celebrations, which differ from our celebrations, is that the person who is celebrating has to treat (or 'почерпи') all his or her guests. In the UK it is normal for everyone to buy a drink for whoever is celebrating. After all it is your celebration and why on earth would you want to spend all that money buying everyone else drinks and nuts and 15 different types of salami? But in Bulgaria they don't seem to mind, and I kind of like that. It is a nice tradition and involves 'giving' and not so much 'receiving'. So although I am still a bit miffed that my bank balance reduces on my Birthday instead of increasing I do prefer the Bulgarian way of doing things. I must admit I still haven't really got used to these 'name days' though. This is mainly because of the popular phrase that my friends keep telling me when my name day approaches "нали знаеш, на имен ден не се кани". What this basically means is that for your name day there is no need to invite people because whoever knows your name can just come along - an unlimited amount of people - meaning you need to buy in a couple more bottles of whisky and a hell of a lot more nuts. Anyway, getting back to this 1st March celebration or 'Баба Марта'. It actually is a really really good celebration. The tradition is to give a friend a red and white bracelet or 'мартеница' (that you can buy from a million temporary kiosks that pop up on the streets a few weeks before) put it on your friend's wrist and say 'Честита Баба Марта' (Happy Granny Marta). As with all Bulgarian celebrations it is also the custom to 'wish' the person different things too. Again this is something I am not very used to, we tend to say 'Happy Birthday' and that's it. In Bulgaria you need to give it a bit more thought, hold the person by the hand, look in their eyes and wish them lots of good things. I admit that even to this day I still find it difficult to think of things to wish people. The standard one seems to be to wish them 'здраве, щастие и любов' (health, happiness and love) but I feel a bit boring repeating this every time and sometimes even resort to Googling wishes in advance. Sometimes I decide to cover all bases just in case and wish them everything I can think of 'здраве, щастие, любов, много пари, нови приключения, много поводи за радост, най-хубавите ти мечти да се сбъдват....' (health, happiness, love, lots of money, new adventures, lots of reasons to be joyful, all your best dreams to come true...). They seem to laugh a bit at this but at least I can't be accused of not getting into the spirit of the celebration wishes. One thing I found out on 'Баба Марта' day this year is that you need to get a really big stash of 'мартеници' ready in your pocket so you are able to return the gesture when someone puts one on your wrist. You need to be prepared because all sorts of people that you just see in everyday life, and whom you may not necessarily count as your friends, may decide to come and give you a 'мартеница' and wish you something good. It really made me smile when the woman shopkeeper who I buy my cucumbers and tomatoes from in the evening, and who is usually quite grumpy, pulled out a 'мартеница', put it on my wrist and with a big, genuine smile wished me lots of health. I was quite touched by this because we never really talked, only a few times a week I went into the shop, I would try my best to order 'краставици' instead of 'красавици', I would pay, say goodbye and leave. But here she was showing me kindness and going out of her way to give me this 'мартеница'. Being my first Baba Marta day in Bulgaria I wasn't prepared and didn't have one to give back to her which I felt a bit silly about but hopefully she understood. Anyway, that one little gesture broke the ice and every time I went in there from then on we would have a little chat and it was if I had gained a new friend. I must have amassed about 10-15 red and white bracelets on 1st March but that was nothing compared to some people I saw that seemed to have 'мартеници' all the way up to their elbow. A few days later I noticed my мартеници were getting a bit dirty so I asked my teacher how long it is polite to keep them on for. She worried me a bit because she said that as soon as I see a stork I can take them off and tie them on a tree or put them under a stone. I was a bit worried because I wasn't entirely sure whether I had ever seen a stork in my life. Was I likely to see one over the next few days I asked. Does seeing one on the television count? My worries were allayed when my teacher thankfully informed me that when you see a tree blossom you can also take them off and hang them on a tree. 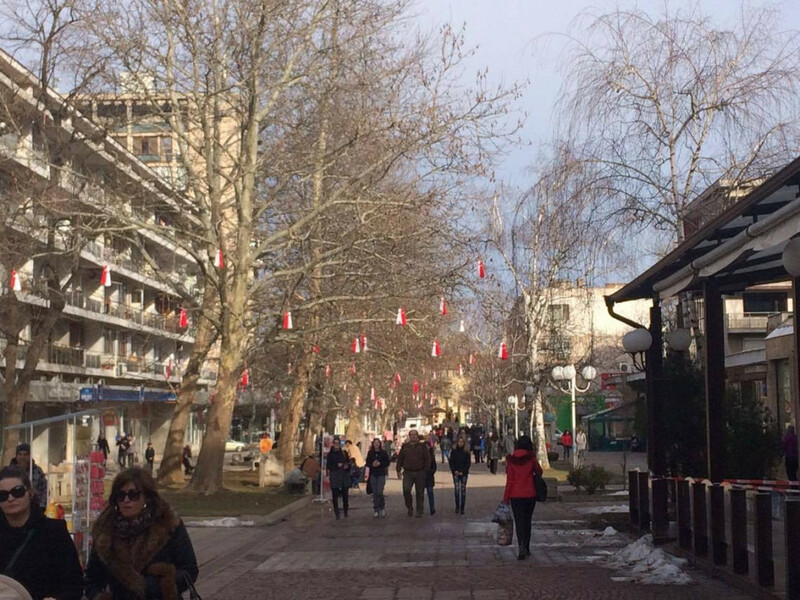 It is a wonderful sight when Spring starts creeping in to see all these red and white bracelets hanging from tree branches everywhere you go, knowing that each one has their own little, or big, story of friendship.